Abstract: Neural information processing and information storage takes place at synaptic contacts. The brain represents a heavily interconnected neuronal network with connections within and between brain subsystems (like e.g. hearing and vision). These effective connections in their totality (the brain´s connectome) determine the individual´s behavior, memory, perceptions and emotions. All sensory systems are mutually connected, but also connected with other brain regions including the motor system, so that loss of hearing affects more than audition (the connectome model of deafness, Kral et al., 2016, 2017). I will review the information on how hearing loss during development affects auditory processing (e.g. Yusuf et al., 2017; Berger et al., 2017) and cross-modal reorganization (e.g. Land et al., 2016, 2018) and will review the potential central factors that contribute to outcome variations in cochlear implant subjects. I will highlight two phases during which the influence is likely strongest: during development and during aging. To improve the outcomes of cochlear implantation, an integrated approach is required that allows to collect and analyze the factors and their combinations that contribute to the outcome in each individual. This requires the understanding of the processes behind hearing and the etiopathophysiology of hearing loss to allow personlized approaches to each individual. Only collaboration across many disciplines can provide an individualized treatment that allows optimal outcomes in the future. Supported by Deutsche Forschungsgemeinschaft, Germany (Exc 1077) and National Science Foundation, USA (in collaboration DLR, grant # 01GQ1703). Berger C, Kühne D, Scheper V, Kral A (2017) Congenital deafness affects deep layers in primary and secondary auditory cortex. J Comp Neurol 525:3110-3125. Kral A, Kronenberger WG, Pisoni DB, O’Donoghue GM (2016) Neurocognitive factors in sensory restoration of early deafness: a connectome model. Lancet Neurol 15:610-621. Kral A, Yusuf PA, Land R (2017) Higher-order auditory areas in congenital deafness: Top-down interactions and corticocortical decoupling. Hear Res 343:50-63. Land R, Radecke JO, Kral A (2018) Congenital Deafness Reduces, But Does Not Eliminate Auditory Responsiveness in Cat Extrastriate Visual Cortex. Neurosci 375:149-157. Land R, Baumhoff P, Tillein J, Lomber SG, Hubka P, Kral A (2016) Cross-Modal Plasticity in Higher-Order Auditory Cortex of Congenitally Deaf Cats Does Not Limit Auditory Responsiveness to Cochlear Implants. J Neurosci 36:6175-6185. Yusuf PA, Hubka P, Tillein J, Kral A (2017) Induced cortical responses require developmental sensory experience. Brain 140:3153-3165. Bio: Andrej Kral was born in Bratislava and studied general medicine (Comenius University, MD 1993, PhD 1998). His first research position was at the Institute of Pathological Physiology, Comenius University (1992 – 1995). 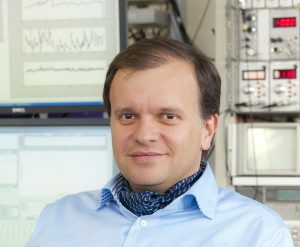 During his PhD, in collaboration with the Mathematical Institute of the Slovak Academy of Science (Prof. V. Majernik), he developed computer models of neuronal networks. In 1995, he moved to Germany to focus to cochlear implants and in vivo neurophysiology at the Institute of Sensory Physiology, J.W.Goethe University, Frankfurt am Main (Prof. R. Klinke). There he was appointed associate professor of physiology (“Priv.-Doz.”) in 2002. From 2004 to 2009 he was Professor of Neurophysiology at the University of Hamburg. Since 2009 he has been appointed Chaired Professor of Auditory Neuroscience at the Medical University Hannover and the director of research of the ENT clinics. Andrej Kral heads the Dept. of Experimental Otology and is the scientific director of the Joint Institute of AudioNeuroTechnology. Since 2004 he has been Adjunct Professor of Neuroscience and Cognition at The University of Texas at Dallas, USA and since 2017 an elected member of the German National Academy of Science. A Kral’s research interests include neuroscience of deafness, cochlear implants, auditory development, brain plasticity, cross-modal reorganization and neuroprosthetic brain stimulation. His research has been published, among others, in New England Journal of Medicine, Science, Lancet Neurology, Nature Neuroscience, Trends in Neuroscience, Brain, Journal of Neuroscience and Cerebral Cortex. A. Kral gave more than 150 invited talks at international conferences and research institutions in US and Europe. Together with A.N.Popper and R.R.Fay he edited the volume of the Springer Handbook of Auditory Research on Deafness (vol. 47). The lab received funding from German Research Society (DFG), Common Scientific Conference Germany, NIH, NSF and DLR, EU, State of Hamburg and State of Lower Saxony and cochlear implant industry.